Join Dan & Galla in a celebration of music and dance! 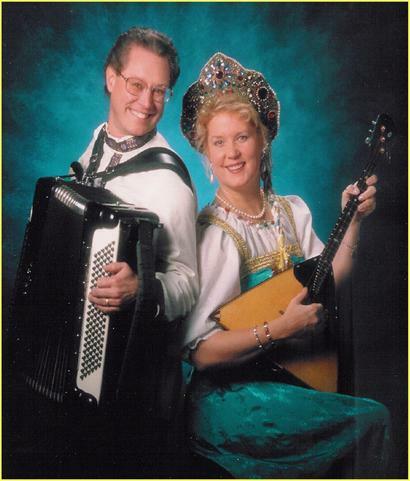 Hear the story of Galla’s Russian background with her balalaika and Dan’s accordion. Dan & Galla begin with a performance and then invite you to become part of the show ~ or just sit back and enjoy the fun! Galla’s mother was born in Russia and escaped with her family as a young girl. She was raised in Japan and came to the USA as a war bride after marrying a handsome major in the US Army. Galla grew up speaking Russian and surrounded by Russian music, culture and customs. She learned to play the balalaika, flute and guitar, often singing and performing at Russian gatherings and special events. She has an avid interest in the music she grew up with and especially enjoys the “lyric songs” known for their emotion and spirit. Dan grew up playing accordion, piano, trombone and trumpet. He transcribes Russian folk songs from old recordings and adapts them for balalaika and accordion as performed by Dan & Galla.